Working group examining the scientific basis for recent, current and future use of non-human primates in biological and medical research. 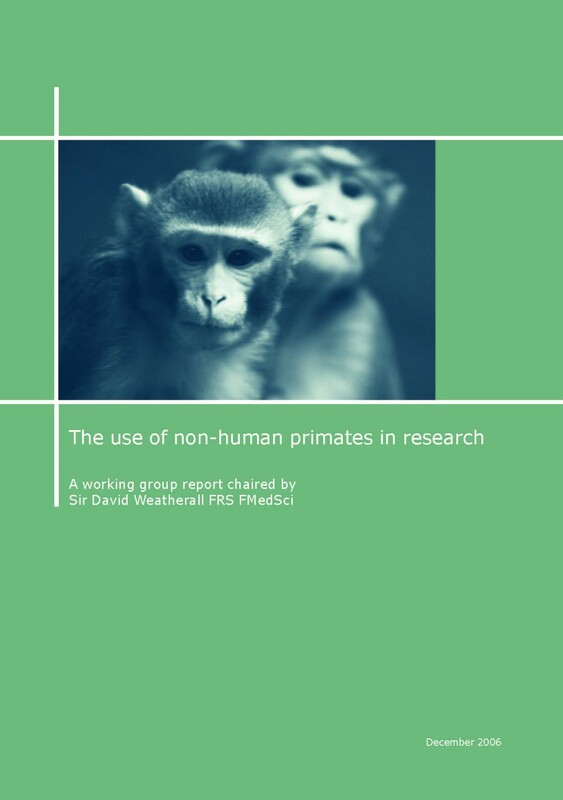 The report of Sir David Weatherall's working group on 'The use of non-human primates in research' was published in December 2006. The remit of this report, which was initiated in March 2005 by the Academy, Medical Research Council, Royal Society and Wellcome Trust, was ‘to examine the scientific basis for recent, current and future use of non-human primates within biological and medical research’. The report was the product of an independent working group; the sponsoring organisations did not provide input into the report's contents, conclusions or recommendations, but committed to consider its recommendations and to respond formally. One of the recommendations of the Weatherall report was that the major funding organisations should undertake a systematic review of the outcomes of their research using non-human primates supported over the last decade. In 2011, the BBSRC, MRC and Wellcome Trust responded to this recommendation by commissioning and funding an independent 'Review of Research Using Non-Human Primates', which was led by Professor Sir Patrick Bateson FRS. The Bateson review aimed to: assess the quality, outputs and impacts of research in this area on advancing knowledge in human and animal health; identify the strengths and weaknesses of the funded science in this field; inform their future science and funding strategies; and feed the outcomes of the review into any Government strategy on NHP use. To examine the scientific basis for the past, current and future use of non-human primates within biological and medical research. To assess the nature and implications of recent and prospective changes in the UK and global capacity to undertake non-human primate research. To review the use of alternatives to non-human primates in different fields of biological and medical research. In undertaking these assessments, to take account of associated ethical, welfare and regulatory issues, particularly with regard to the 3Rs principle of replacement, refinement and reduction of animals in research.